This unusual and interesting name has a very ancient history. It is one of the Norman forms of the Germanic personal name "Hermann", composed of the elements "heri" or "hari", meaning "army", plus "man", man. The first known bearer of the name was Arminus the 1st Century leader of a tribe called the "Cherusci", recorded by the Latin historian Tacitus. 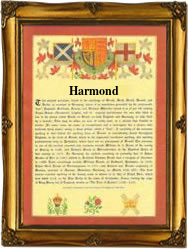 The personal name has generated a wide variety and a large number of surnames throughout Europe, in England the inherited Norman forms, existing in the modern idiom are "Hearmon, Herman, Harmon, Harmond, Harmant and Hermon". The name development has included "Robert Hereman" (1196, Norfolk), "William Heremond, (1296, Sussex) and "John Harman" (1327, Suffolk). The form Hearmon is particularly well recorded in Berkshire Church Registers from the early part of the 17th Century. On October 12th 1634 Richard Hearmon and Elnor Whitaker were married in East Lockinge, and on October 18th 1791 William Hermon married a Hannah Stimpson in Aston Tirrold. One of the earliest examples of the name from London Church Records is that of John Hearmon, witness at the christening of his son John, at St. Luke's, Chelsea, on April 21st 1817. The first recorded spelling of the family name is shown to be that of Willelmus Heremannus. which was dated 1141 - 1149, Records of Holme, Norfolk. during the reign of Stephen, Count of Blois, 1135 - 1154. Surnames became necessary when governments introduced personal taxation. In England this was known as Poll Tax. Throughout the centuries, surnames in every country have continued to "develop" often leading to astonishing variants of the original spelling.